In a garage or workshop where exhaust gases like Carbon Monoxide (CO) and NOx from vehicles are very dangerous - proper ventilation is very important. Garages or workshops with floor areas more than 500 ft2 (50m2) should always have mechanical ventilation with fans. Smaller garages can have natural ventilation with evacuation of air through ducts with larger area than 0.2% of the floor area. Comparing the two calculations - the fresh air supply should be at least 1200 m3/h. Comparing the two calculations the fresh air supply should be at least 6000 m3/h. Local regulations and codes must always be adapted. 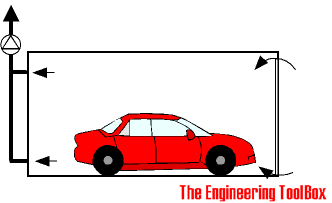 It is important not to underestimate the influence of traffic in the garage on the required air flow. NOTE! - CO can be very dangerous! The fresh air is supplied through openings in the outside wall. Polluted air is evacuated through openings close to the floor and the roof. For larger buildings and garages it is common to use outlet air from the ventilation systems in the surrounding buildings as fresh make-up air to the garages. Air with room temperature (or temperature after the heat recovery unit) is supplied to the garage. Polluted air is evacuated through openings close to the floor and the roof. Engineering ToolBox, (2006). Garage Ventilation. 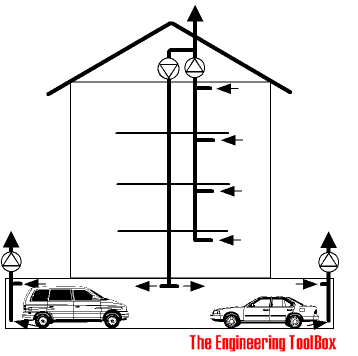 [online] Available at: https://www.engineeringtoolbox.com/garage-ventilation-d_1017.html [Accessed Day Mo. Year].